The Labor Force Participation Rate (LFPR) of women 25 to 54 years old peaked in April 2000 at 77.3%. By January 2013, the most recent month available, it had dropped to 74.0%. This decline in women’s LFPR is contrary to the very consistent and long lasting increase in women’s LFPR that was the rule from 1870 to 2000. Comparing 2012 to 2000 it is the women of lower status; young women, not married women, and black women who have seen the largest drops in their LFPR. This suggests economic factors and greater welfare benefits to compensate for the recession are what is driving lower status women to leave the labor force. There is the issue that women who earn less money find their child care expenses are so high that working makes little economic sense. Such women on the border line of work being profitable for their families economically would then drop out of the labor force if their child care expenses increased or if their earnings decreased. If one approaches the issue of women working by focusing on the stay-at-home mother one sees something different going on in the process of women leaving the labor force. From 1969 to 2009 the proportion of married couples with children under 15 with a stay-at-home mother went from 43.9% in 1969 to 24.5% in 1989 to 25.8% in 2009. The big drop was from 1969 to 1989 and then after 1989 it has stayed pretty flat. What is more interesting though is that there have been two major forces pushing in opposite directions regarding the proportion of stay-at-home mothers. Thinking of mothers in terms of their class status much changed from 1969 to 2009. In the dimension of age a younger woman is lower class, she has less resources and developed abilities, while an older woman is higher class. In the dimension of education lower educational attainment is lower class while higher educational attainment is higher class. In 1969 mothers regardless of their class level were about equally likely to be stay-at-home mothers; the highest and lowest class levels were both somewhat less likely to be stay-at-home mothers but not by much. In 2009 the lower class mothers were much more likely to be stay-at-home mothers with a steady and continuous drop in the proportion of stay-at-home mothers the higher the class level of the mother. All of the mothers I am talking about here are married; I am only talking about the married population here. While non-working motherhood developed into a lower class behavior there was a great drive towards mothers becoming more upper class. The way a mother increases her status level is by becoming a mother later in life; older age equating to higher status; and by increasing her level of educational attainment. This has happened on a wide scale. What this means is that while stay-at-home motherhood became more and more the province of lower status women at the same time women greatly increased their status level. The class status of mothers has steadily increased throughout the period of 1969 to 2009; in other words women have been having children at older and older ages and they have been continually increasing their educational attainment. What is new is that the proportion of mothers who are stay-at-home mothers after dropping radically at every status level from 1969 to 1989 saw increases at the lower status levels from 1989 to 1999 and saw increases across the board from 1999 to 2009. In 2009 lower status women were definitely stay-at-home mothers more frequently than higher status women but from 1999 to 2009 the likelihood of any mother being a stay-at-home mother given her status level increased. Radical increases were seen among mothers with Some College or a Bachelor’s Degree or Higher. 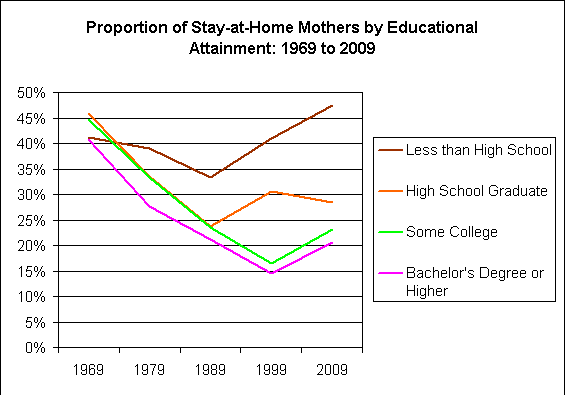 From 1999 to 2009 the proportion of mothers with Some College who were stay-at-home mothers went from 16.5% to 23.2%; for mothers with a Bachelor’s Degree or Higher they went from 14.6% to 20.6%. These are increases of 41% in proportional terms in just a decade for mothers in the top two-thirds of educational attainment in 2009. The increase in stay-at-home motherhood was greater at the higher educational levels than for the lower educational levels from 1999 to 2009; this means that the lower-class association with stay-at-home motherhood is weakening. We’re still a long way away from stay-at-home motherhood becoming the norm and it not being strongly associated with class status but at least the time period from 1999 to 2009 moved in that direction. Furthermore increases in stay-at-home motherhood were universal given the mother’s class status from 1999 to 2009. This is the clearest evidence I have found that the decrease in women’s labor force participation is due to positive cultural factors. The trend towards stay-at-home motherhood is very clear and increasing rapidly for those with Some College or more when the mother’s status level is fixed. The overall decrease in women’s LFPR is muted due to women continuing to seek higher status levels which raises their workforce participation rate but the decrease in women’s LFPR at any particular status level is now the more powerful factor leading to the overall decline in women’s LFPR. All of the data I am using come from that one table. Computations are done to display the data in an alternative form but all my source data comes from Table 1 on page 24 of the report. The original data comes from the Current Population Survey. Definitions: The column headings are years. The data are given by Age Group and Educational Attainment. “Proportion of Stay-at-Home Mothers” refers to the proportion of all mothers who are stay-at-home mothers in the Age Group or Educational Attainment level in the year specified. The Age Group refers to the age of the mother herself and the Educational Attainment level is the Educational Attainment of the mother. A “stay-at-home” mother is defined as a mother who herself was out of the labor force for the entire previous year and whose husband was in the labor force during the entire previous year for 50 or more weeks. These mothers furthermore are all married with children under 15 years old in the household. The population under consideration is all married women with children under 15 years old. “Distribution of All Mothers” refers to the proportion of all married women with children under 15 years old who are in the particular Age Group or Educational Attainment level in the specified year. All of the Age Groups or Educational Attainment levels add up to 100% for a particular year. 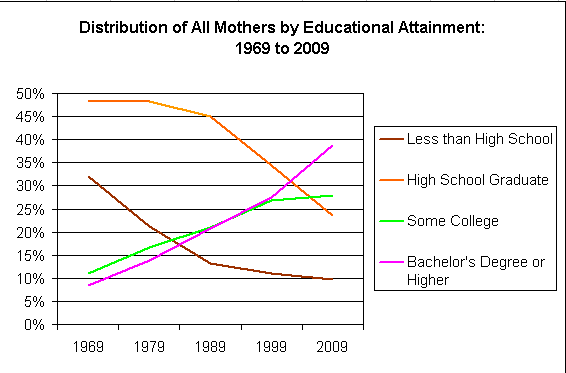 This entry was posted in Previously Written Articles, Social Statistics and tagged declining association of low education with non-working motherhood, increase in age and education level of mothers, increase in stay-at-home mothers, married college educated women increasingly stay-at-home mothers, stay-at-home motherhood increasing among all ages and all education levels. Bookmark the permalink.